Launched in 2004, the GMI is an international public-private initiative that advances cost-effective, near-term methane abatement and recovery and use of methane as a clean energy source in three sectors: biogas (including agriculture, municipal solid waste, and wastewater), coal mines, and oil and gas systems. Working in collaboration with other international organizations, the Initiative has formed key alliances with partners such as the United Nations Economic Commission for Europe (UNECE) and the Climate and Clean Air Coalition (CCAC) to reduce global methane emissions. Focusing collective efforts on methane emission sources is a cost-effective approach to reduce greenhouse gas (GHG) emissions and increase energy security, enhance economic growth, improve air quality and improve worker safety. During the 2018 Global Methane Forum, GMI Partners reaffirmed their commitment to the Initiative in the GMI Partners Communique (PDF, 2 pp), a consensus statement on GMI’s accomplishments over the last 10 years, as well as priorities for the future. Activities of the GMI are focused on reducing informational, institutional, and market barriers to project development by making available tools and resources, providing training and capacity building, conducting technology demonstrations, and offering direct project support. 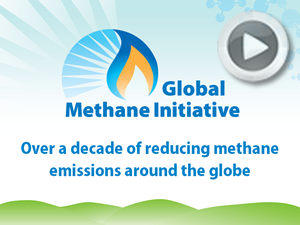 More detailed information about the Initiative is available in the Global Methane Initiative: An Overview (PDF, 2 pp., 1.0 MB) and Frequently Asked Questions. Learn more about the benefits associated with methane emission reductions at About Methane or in Global Methane Emissions and Mitigation Opportunities (PDF, 4 pp., 2.5 MB) (December 2015). The GMI has formed strategic alliances to substantially reduce methane emissions. The GMI consists of a Steering Committee, three technical subcommittees, the Project Network, and the Administrative Support Group (ASG) that work together to promote project development and encourage active engagement from the private sector. The Steering Committee, which guides the work of the GMI, is supported by the ASG. It governs the Initiative's framework, policies and procedures. Partner Countries may appoint up to two representatives to the Steering Committee. All Partners are considered Steering Committee "observers" from the time they join the Initiative. Twelve months after joining and any time thereafter, Partner Countries may submit a request to become a Steering Committee member by sending a letter to the ASG that outlines their engagement (PDF, 1 p., 30 KB) in the Initiative. The Administrative Support Group (ASG), currently hosted by the U.S. Environmental Protection Agency, serves as the secretariat for the GMI. The ASG provides administrative and logistical support and also serves as an information clearinghouse. The Technical Subcommittees are organized by the main sources of methane emissions. Partner Countries appoint technical experts from either the government or the private sector to the technical subcommittees. Each subcommittee has developed a Subcommittee Action Plan that identifies the needs, opportunities and priorities for project development globally as well as key barriers and strategies to address them. The Subcommittees are focusing their efforts on developing Partner Sector Action Plans (PDF, 3 pp, 139 KB) to provide more detailed information to assist project development in each respective Partner Country. 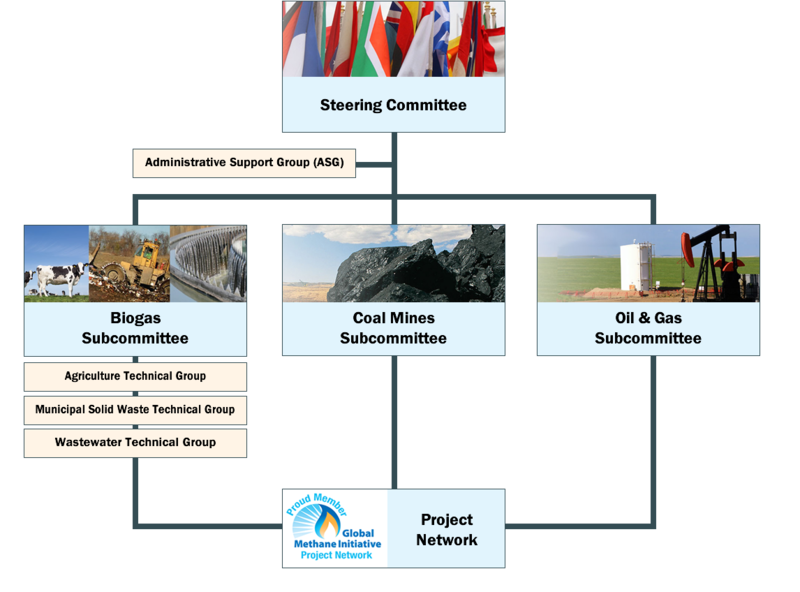 The technical subcommittees also facilitate investment and financing opportunities and other cooperative activities and projects to advance the abatement and recovery of methane and its use as an energy source. To take advantage of shared considerations and opportunities, the GMI recently created the Biogas Subcommittee. Technical groups for agriculture, municipal solid waste, and wastewater are organized within the Biogas Subcommittee. The Project Network consists of representatives from industry, the research community, financial institutions, state and local governments and other expert stakeholders with an interest in developing and supporting methane abatement, recovery, and use projects in Partner Countries. Project Network members share their technical expertise, experience, and financial resources and are encouraged to attend subcommittee meetings and participate in developing sector-specific Action Plans. They also participate in specific activities such as capacity building, technology transfer, and outreach. By participating in the Project Network, these organizations are identifying potential project opportunities, making connections, staying informed and gaining recognition for their achievements. More details about the organizational framework are provided in the Terms of Reference.